There are thousands of different species of bacteria in the world and there are multiple species of bacteria that live on the skin surface. Many of these bacteria are harmless. It is considered as part of the normal skin flora along with certain species of fungi. However, sometimes even these bacteria can “turn” against the body and cause skin infections. The makeup of the normal skin flora can vary. For example, a species known as Staphylococcus epidermidis is commonly found on the skin of people while Staphylococcus aureus is less common but nevertheless occasionally found on healthy skin. What is a Staph skin infection? A staph (not staff) skin infection is where the Staphylococcus species of bacteria infect the skin. 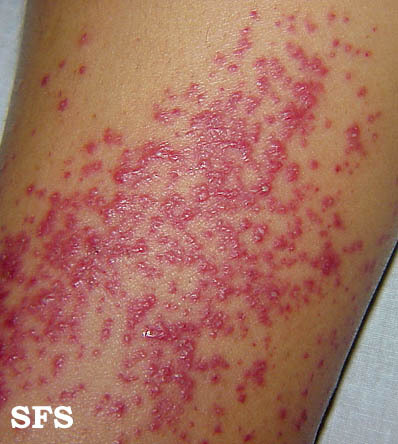 The most frequent pathogen in a staph skin infection is Staphylococcus aureus but even the commonly found Staphylococcus epidermidis can cause a skin infection in rare cases. The bacteria thrives at the site and causes skin inflammation in an infection. While some staph skin infections may be mild, others can be severe and even lead to life-threatening complications. Up to 80% of Americans have Staphylococcus aureus on their skin every now and then. Only 20% to 30% have this bacteria on their skin on an ongoing basis. Staphylococcus aureus is present throughout the globe and most people come into contact with it in the environment several times in day. However, the presence of staphylococci does not mean that it will definitely lead to a staph skin infection. Fortunately staph skin infections can be effectively treated with modern antibiotics but the emergence of MRSA has raised the concern about drug resistant strains. The skin is a very effective physical barrier in preventing bacteria from entering underlying tissue. In this way “dangerous” bacteria can live on the skin surface and not cause any problems. A break in the skin can change the situation in that the bacteria can easily reach deeper lying tissue. Breaks in the skin can occur easily throughout the course of a regular day. Some breaks in the skin are deeper and more obvious that others like a knife wound while micro-tears are often not seen or even felt. However, it is the immune system that ensures that infections do not arise with a break in the skin. 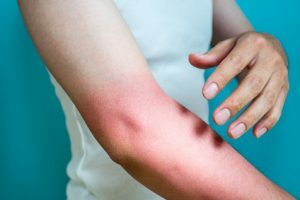 The immune cells and chemicals quickly attack any bacteria that may enter a wound but if the wound is very large or the immune system is weakened, then even skin bacteria that live harmlessly on the skin can cause an infection. There are other factors that can lead to staph skin infections but skin injuries and a weakened immune system are the main predisposing factors. Staphylococci may also be found in the nose of carriers without causing any disease. However, sinus and nasal infections can eventually arise for the same reasons as a skin infection may arise among people who have Staphylococcus aureus naturally occurring on their skin. Infections at different locations may be termed according to different names. However, these different conditions are all superficial infections caused Staphylococcus aureus, other bacteria and sometimes fungi or viruses. There may be many common symptoms like skin redness, small bumps on the skin, pain, heat on the skin surface and fever in some cases. The bacteria and its toxins can spread from the initial site and lead to life-threatening complications, eventually culminating in death if treatment is not forthcoming. Folliculitis is a condition where the hair follicle in the skin becomes infected. Apart from the palms and soles, this type of infection can occur anywhere on the body. It appears like tiny boils or pustular pimples at the base of a hair shaft. Damaged follicles are more likely to become infected. Folliculitis can arise even when there is no break in the skin like with friction from clothing that causes mild skin irritation. Images sourced from the Dermatology Atlas Brazil (atlasdermatologico.com.br). An abscess is a collection of pus which is often referred to as a boil when it occurs on the skin surface or just under the skin. Pus is fluid containing dead cells, microbes like bacteria, cellular debris, blood and tissue fluid. It is the way the body walls off an infection. On the surface it appears as a red lump that is painful and warm to the touch. It can eventually burst and the pus drains out on to the skin surface. 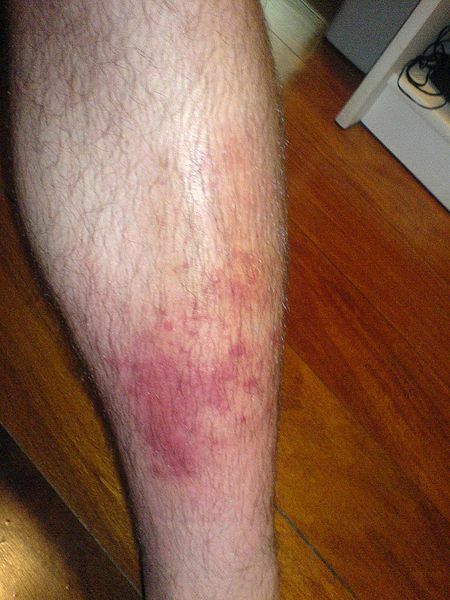 Cellulitis is an infection of the tissue underneath the skin like the subcutaneous fat. 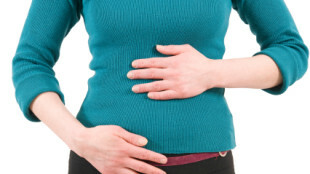 It is a deeper infection that can rapidly spread and lead to life-threatening complications. It may occur with deeper penetrating injuries that allows the bacteria to bypass the superficial layers of the skin. Sometimes it may be a complication of a superficial skin infection. The affected area is red, painful and there is usually a fever present. Impetigo is a superficial skin infection that is mainly seen in children with conditions like atopic dermatitis (eczema). It presents with oozing discharge that leads to yellow crusting over the infected area although this classical presentation may not always be visible. The infection may rapidly spread especially to other areas that is also affected with the eczema. There may be no fever or pain. Staph skin infections can be treated with antibiotics. For superficial infections that are uncomplicated and mild, topical applications may suffice. However, more severe and serious infections require oral antibiotics or even IV antibiotics. The choice of antibiotic depends on several factors including the location and severity of the infection as well as any drug allergies. With the rise in methicillin-resistant Staphylococcus aureus (MRSA), it is important that even minor infections are properly treated to prevent drug resistance. MRSA must be treated and managed under the supervision of a medical practitioner.